The Irish Parachute Club (IPC) is located in Clonbullogue, County Offaly, in Ireland. It was founded in 1956 by wartime paratrooper Freddie Bond and began operations at Weston airfield in Leixlip, training several teams for international competition. During the harsh winter of 1962, the IPC parachuted emergency supplies to snowbound farms in the Wicklow Mountains. The club later operated from a number of locations before establishing a drop zone in 1974 at Tokn Grass, west of Edenderry. The first club aircraft, a Cessna 172, was bought in the same year. In 1983, a Cessna 206 was bought and, in 1988, the club moved to its current location at Clonbullogue Airfield. skydiving, Accelerated Freefall, Static Line Parachuting, and training programmes. of Clonbollogue and 6 NM (11 km; 6.9 mi) south of Edenderry in County Offaly, Ireland. It is owned and operated by the Irish Parachute Club which is based at the field. The airfield has one grass runway which is the largest grass runway in Europe running east – west which is 770 by 18 m (2,526 by 59 ft). Six aircraft are based at the field, most of them owned by the Irish Parachute Club. There is usually busy parachuting at weekends and public holidays so flying restrictions are enforced around this area. 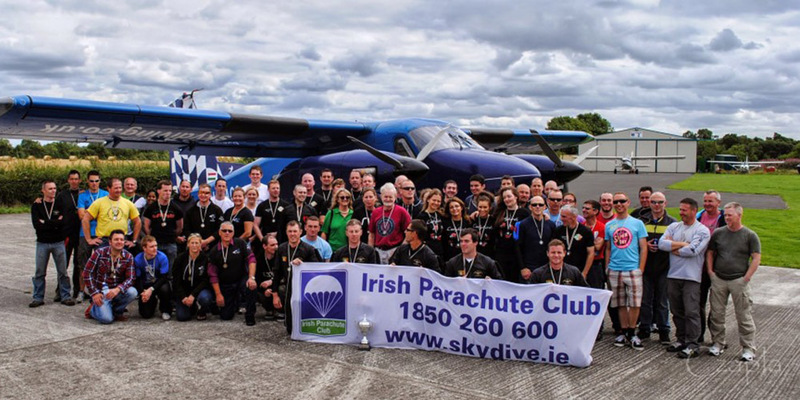 The Irish Parachute Club has 56 years experience of sport parachuting. In excess of 12,000 jumps are made annually at our club, which is run by skydivers for skydivers. We train people from first jump to International Competition Levels. After your first jump we at the Irish Parachute Club hope you will continue in the exciting sport of skydiving and the associated social life which has an international dimension. We have our own fleet of aircraft and use the most modern up to date parachuting equipment.